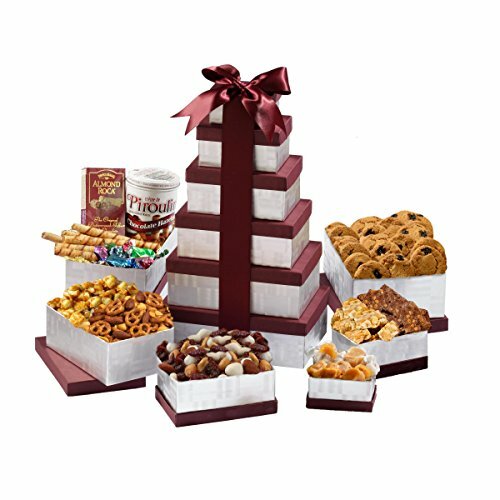 This majestic gift tower is the final stop in your search for the perfect gift basket. Whatever the reason, whatever the season, this gift tower sums it all up in majestic style. Filled with soft vanilla caramels, Pirouline wafer rolls, sweet & savory snack mix, blueberry Greek yogurt cookies, berry cherry trail mix, and more, your gourmet experience has just begun. GIFT TOWER DIMENSIONS: 7" x 5" x 16"